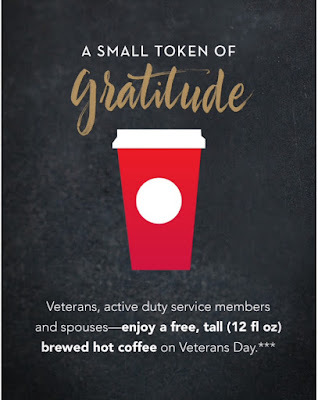 On Veterans Day, Wednesday, October 11th 2015, Veterans, active duty service members and spouses can enjoy a FREE tall (12 fl oz) brewed Starbucks coffee. At participating stores. One per customer. Customization not included.